What appears to be an unspoiled forest scene in this painting actually shows a manmade bush grotto called Fernz Fernery. Located adjacent to the Auckland Domain Wintergardens, New Zealand. It’s a small area filled with native New Zealand bush flora. Bush Walk 2 is one of many bush paintings by the artist, and was a finalist in the Molly Morpeth Canaday Art Award in 2012. Acrylic on canvas. 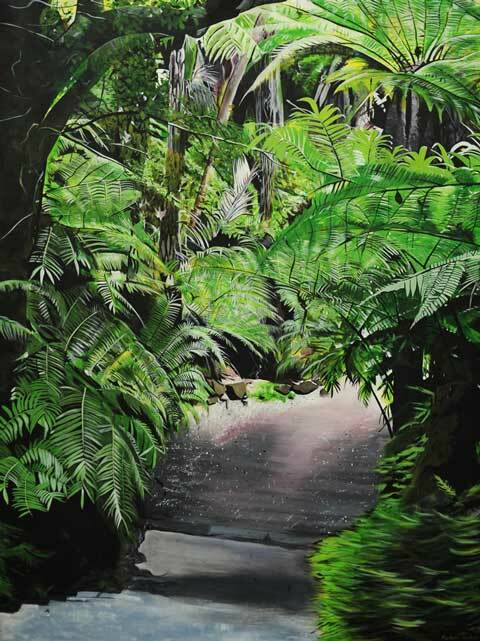 This is a painting of a walk through the Fernz Fernery, an Auckland Historic Place,located beside the Auckland Domain Wintergarden.